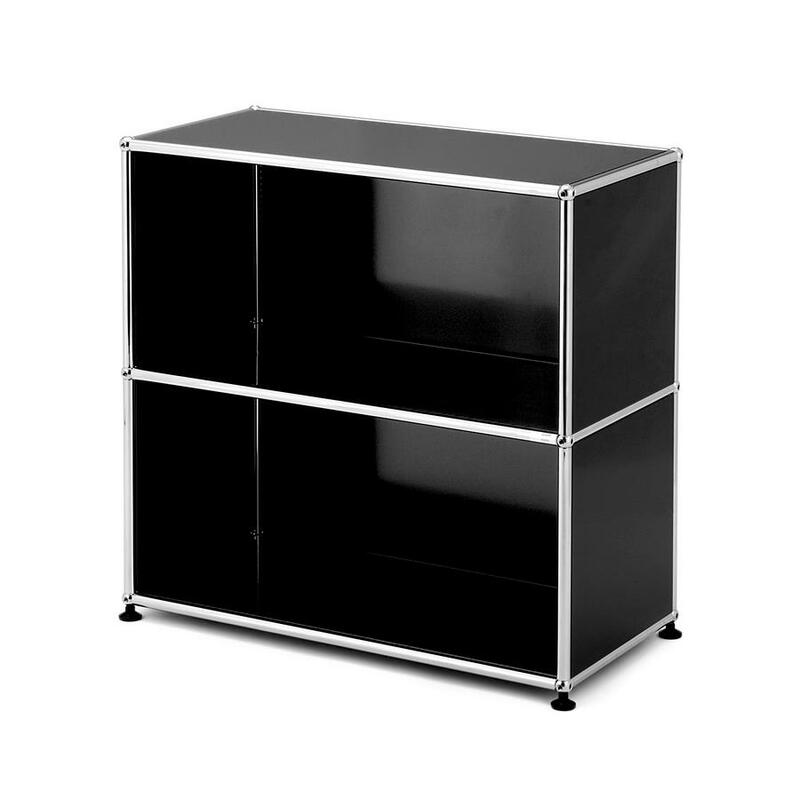 Is it possible to install a USM mobile cabinet drawers to a USM sideboard? No, unfortunately this is not possible. The mobile container drawers require a shelf depth of 500 mm. The shelf depth of this sideboard is only 350 mm. Are the necessary tools and assembly instructions delivered with the sideboard? No. The sideboard is delivered fully assembled. And so tools and assembly instructions are not required. 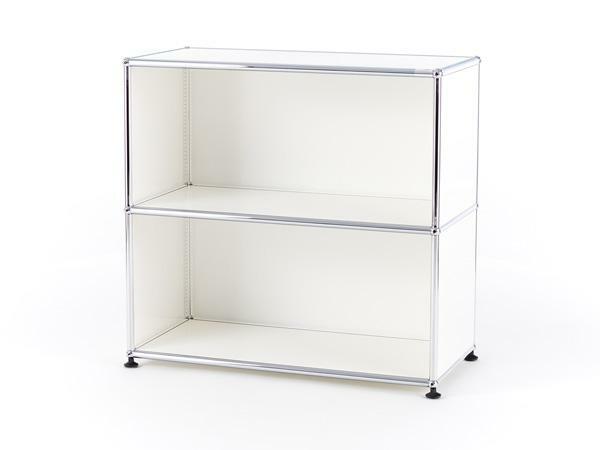 For my books a shelf depth of 250 mm would be sufficient - can provide the sideboard in such a version? We are always happy to provide you with a customised offer. Alternatively, you can plan your own sideboard in the smow USM Haller configurator. Following the completion of a commission to construct new office and production buildings for USM Fritz Haller was asked if he could also develop office furniture for the company. Completed in 1963 Fritz Haller's system didn't just meet the USM brief but set new standards in modular and function-oriented office furniture. The series production of the USM Haller family began in 1969, after USM Haller had been commissioned with furnishing the Rothschild Bank in Paris. rue to the principle that "furnishings are not a state but a process" the USM furniture system helped establish the concept of the open-plan office throughout the 1970s. USM furniture is based on a simple design that allows maximum flexibility, and which can be redesigned and rebuilt as often as required. The USM Haller sideboard M is one of the simpler versions of the furniture system and can thanks to its reduced aesthetic and wide choice of colours can be successfully employed in a number of commercial and domestic settings. Fritz Haller was born in 1924 in the Swiss town of Solothurn and worked before, during and after his co-operations with USM an independent architect. 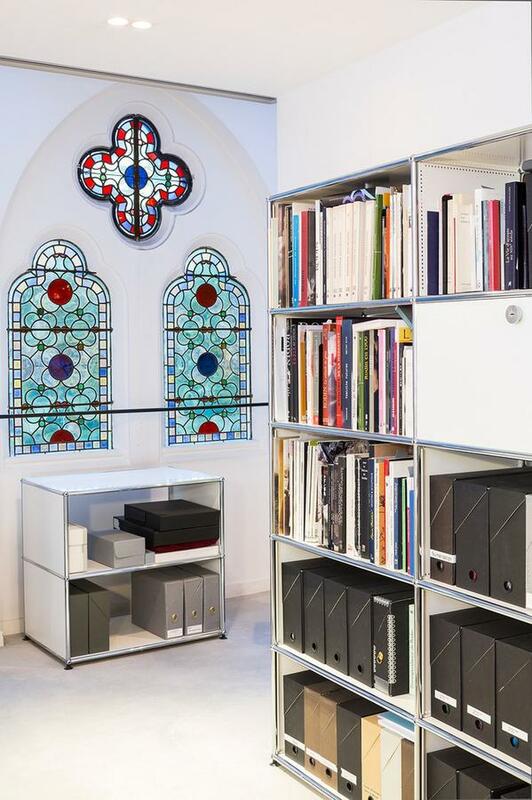 In 1961 he was commissioned by USM director Paul Schärer with the planning of new production and administration building and two years later developed for the new USM office pavilion a new shelving and storage system. Even if the USM modular furniture system would remain his only furniture design, it was also to become his greatest success. 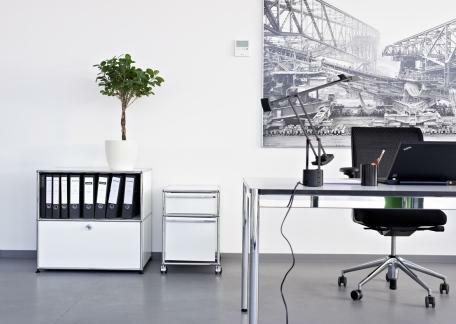 Originally designed for the USM offices, Fritz Haller's metal furniture is now not only an established office furniture classic, but is becoming increasingly popular in the home. For his furniture design Fritz Haller has won several awards and also seen his system be added to the permanent collection of the MoMA in New York. In addition to working as an architect Fritz Haller also taught at the universities of Karlsruhe and Stuttgart. 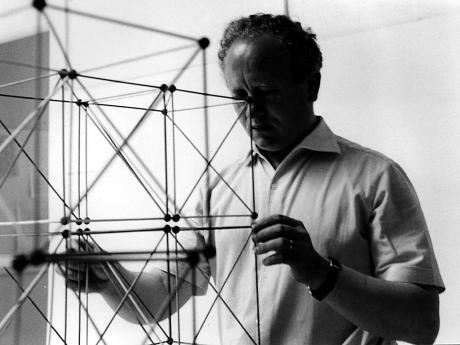 Fritz Haller died in October 2012. In 1885 Ulrich Schärer established USM as a hardware store and locksmith business. In the 1920s the company added the production of window fittings and in the 1940s general sheet metal fabrication. 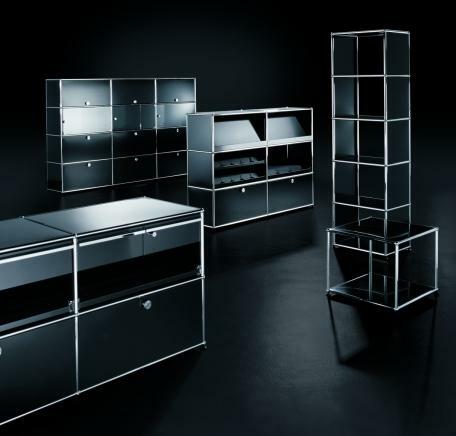 Then in the 1960s , in context of a general reorganisation came the most important development in the USM story: the development of the USM Haller modular furniture system. Originally developed by Fritz Haller for the exclusive use in his new USM office pavilion, in 1969 USM were commissioned to furnish the Rothschild Bank in Paris. In the wake of this commission USM began with the serial production of Fritz Haller's system, and so began the global success story. 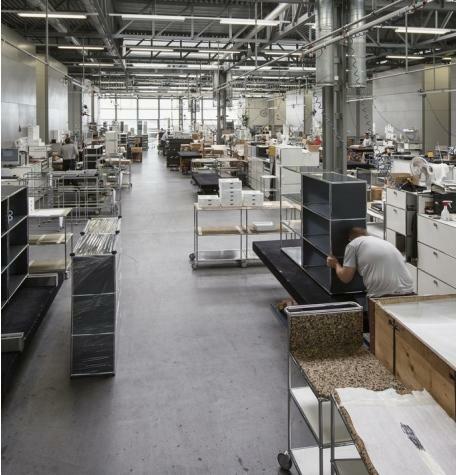 Since then, USM Haller has become one of the most innovative and renowned furnishing systems. And since 1992, USM has focused exclusively on the production and development of furniture system. USM Sideboard M with one drop-down door in USM Haller white. At its Swiss headquarters in Münsingen USM Haller produce and powder coat all the metal components for the famous USM Haller furniture system. Assembly of the ordered units is then either carried out in Münsingen, or at one of USM's regional factories. The assembly of German bound orders, for example, is carried out at the USM factory in Bühl, Baden-Württemberg. 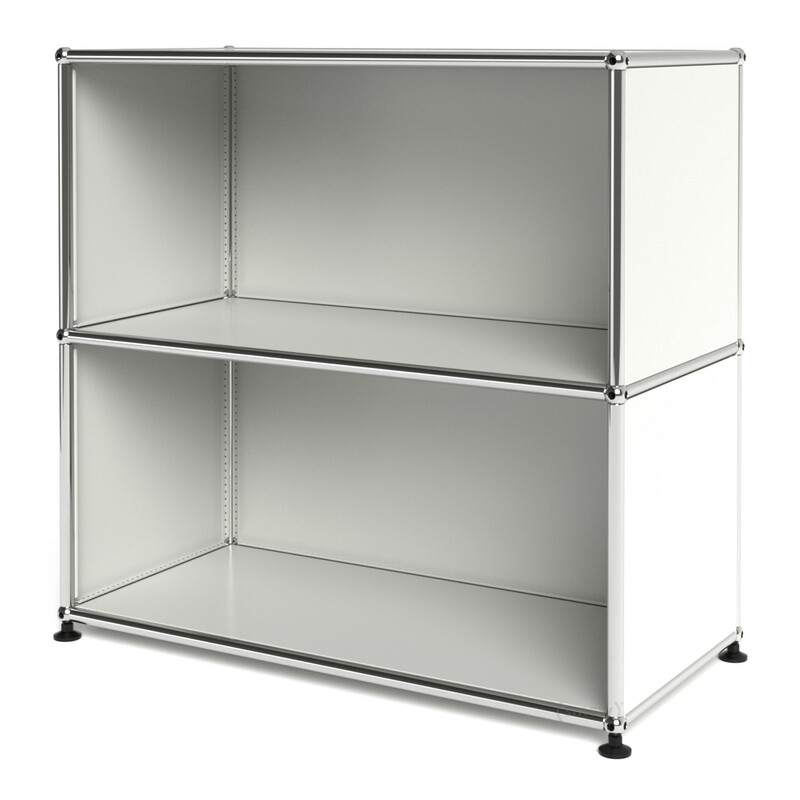 With the distribution of unassembled units, USM saves space and thus resources. In addition the final, assembled, USM Haller units can be considered as an ecologically sustainable product: on the one hand the fact that only high quality, and so very durable materials, and are used in the construction of USM furniture guarantees a long life cycle, while the ability to redesign and rebuild the system as required means that, in principle, one need never dispose of a USM Haller unit. Simply reconfigure it to meet the new demands. With USM form intrinsically follows function, thus allowing the furniture system to be easily understood in the context of design history: post war functionalism achieving in Fritz Haller's design a genuine highpoint. Thanks to the system's fairly simple design principle a wide variety of forms is possible: and in every case shape of which depends on their function. 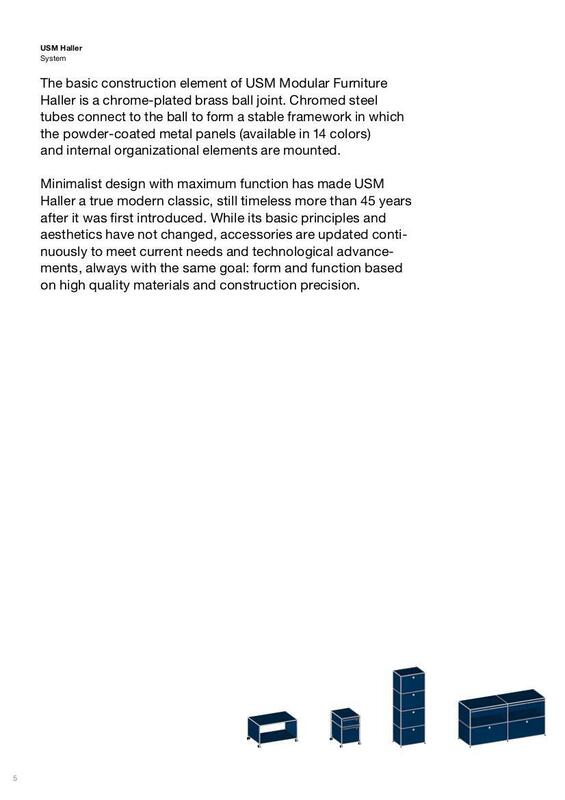 This ease of transformation and the timelessness of the functionalist furniture design meaning that over the past five decades the USM Haller system has evolved to a genuine and very popular furniture design classic. Fritz Haller's USM modular furniture: functional and practical.